Clint Eastwood is the definition of a Hollywood icon. He's done it all. His early stuff was playing Dirty Harry and appearing in every movie western under the sun. Then there is Eastwood the director. Unforgivin (1992), Mystic River (2003), A Perfect World (1993). The list goes on and on. Now, in his glorious 80's, he doing the whole grumpy old man thing. In Million Dollar Baby (2004), he was a grumpy old boxing trainer. In Gran Torino (2008), he was a racist grumpy old retiree. Now he plays a grumpy old baseball scout in Trouble With The Curve, a film I put down as one of my top movies of 2012. Directed by Robert Lorenz (he was an executive producer on Eastwood's film Blood Work (2002)), "Curve" tells the story of Gus Lobel (Eastwood), an aging baseball scout who's job skills are being questioned by the Atlanta Braves organization. The director of operations (Philip Sanderson played by Matthew Lillard) and the team president (Robert Patrick), feel that Gus should take an early retirement and let new blood inhabit the scouting department. Gus, who's eye vision is going in the wrong direction, is assigned to scout a raw upcoming talent. This is a young baseball player that the Braves are certain, is a number one pick in the upcoming draft as well as the franchise player for the "next ten years." So Gus ventures out to North Carolina to see this phenom accompanied by his fiery daughter Mickey (Amy Adams). Of course you need a romantic interest for Amy Adams (she's gorgeous) so you get Justin Timberlake (he plays Johnny "The Flame" Flanagan). He's an ex-major league pitcher and current scout for the Red Sox. Timberlake's character is mainly window dressing. He follows the potential Braves phenom (Bo Gentry is his name) along with Gus all the while trying to get a job as a Red Sox announcer and romance Gus's daughter. Mainly though, the movie centers on the relationship between Eastwood's character and Mickey with some small flashbacks delving deeper into what makes both of them tick. This tactic pays off as the film inches closer to its conclusion. 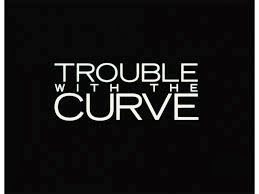 Trouble With The Curve is a simple, light and breezy film that throws in a lot of movie cliches that scream predictability. All the plot points fit like easy little puzzle pieces. To my dismay though, I did enjoy what I saw on screen. The actors were likable and the performances were just good enough to sell the weak script that seemed to be recycled from other sports movies. "Curve's" appeal lies in the fact that what we get is an old fashioned movie going experience, kinda like the sports films that came out in the late 70's (think Breaking Away in 1979). I'm also a big fan of this film because it goes behind the scenes. You don't always have to tell the story from the perspective of the team, the coach, or the players. Moneyball (2011) did it superbly a couple years ago with Brad Pitt as a general manager of the Oakland A's. Now Clint scores with "Curve" because its similar to Moneyball and it entertains the audience ultimately showcasing his best qualities as an actor. He's built a new niche for himself and it shows in his most recent work on screen. The one thing I didn't see coming in "Curve" was the ending. It was uplifting and it made it a better movie than it really is. It's as gold of a Hollywood ending as a big tub of buttered popcorn. So to close my review, I'm not quite sure what kinds of films Eastwood plans on doing in the future. But he made my day with this one. Watch Trouble With The Curve on a nice lazy day when you have nothing to do but relax. It will put a smile on your face, guaranteed.